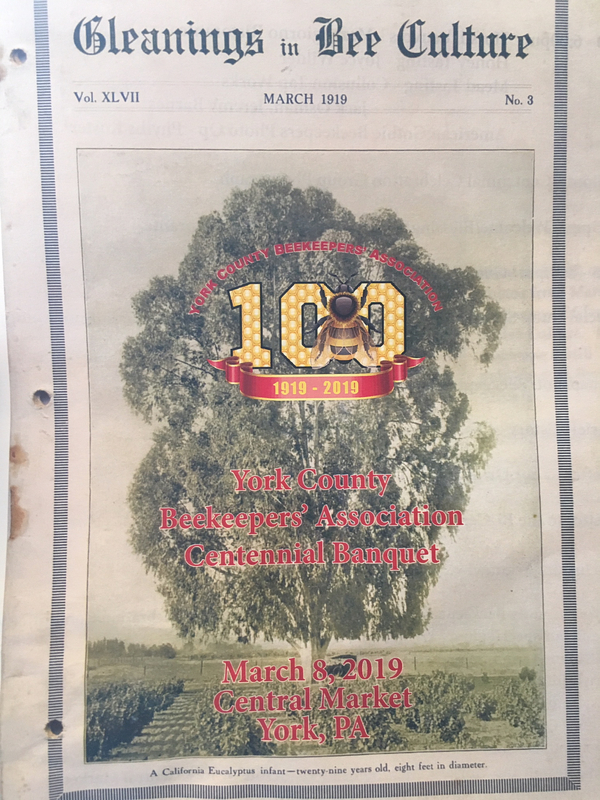 The York County Beekeeping Association's centennial program. Jamie Kinsley Photo. This past Sunday, a raccoon attacked one of my chickens. I heard one of my hens squawk loudly on my back porch so I got up from my computer to check it out. I found a large, gray raccoon grabbing at her feathers right outside my door. I screamed! I didn’t know what to do. It got me thinking about wildlife that encroaches on our lives. My house is nestled in farm country in Seven Valleys. Living on the fringe of wilderness and civilization, I can’t necessarily blame the wildlife that crept onto my doorstep because really, I’m living on their doorstep just as much. 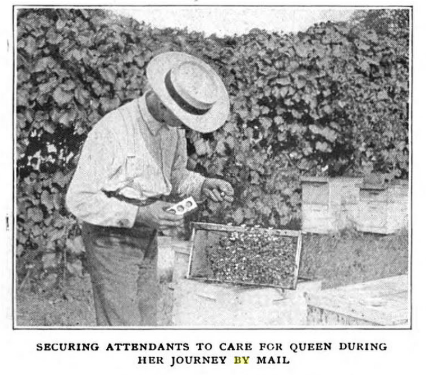 Handling a comb full of bees. 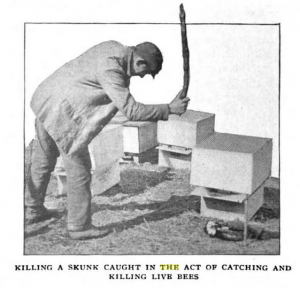 Photo from Biggle Bee Book by Jacob Biggle, 1909. Bugs and insects are a part of that wildlife. Even as I write this article, I see dozens of ladybugs taking circular walks across the glass pains of my French doors. Insects are one of our closest non-domesticated neighbors. Spiders find their way into our window sills, ticks burrow into my dog’s skin, ants creep up into the donuts I left sitting out on the kitchen counter, and bees hum in my garden. However, in a very real sense, insects are some of our most secretive mysteries. Is that spider venomous? Will that bee sting me? In addition to encouraging good beekeeping, the York County Beekeeping Association’s primary mission is education. And this year marks a time to celebrate. 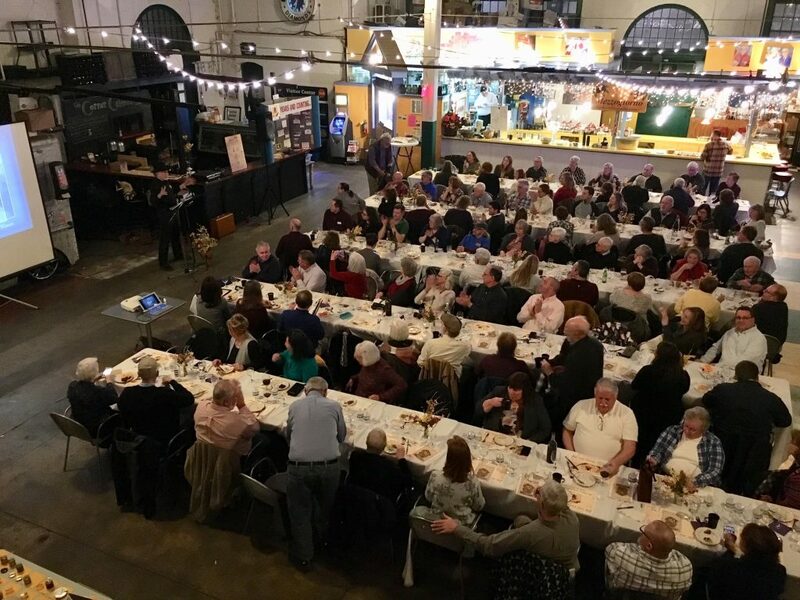 On March 8th, 100 people attended the 100-year anniversary of the YCBA at Central Market. Honey tasting at YCBA’s 100 year celebration. Jamie Kinsley Photo. After hor d’oeuvres, members and guests enjoyed honey and mead tasting. Dinner, sponsored by Mezzogiorno Ristorante, kept everyone full for a fun night of storytelling and history. Following dinner, various presenters congratulated the group including Doug Hoke, a York County commissioner. One of the most interesting aspects of the evening were the letters to the five founders of YCBA 100 years ago. 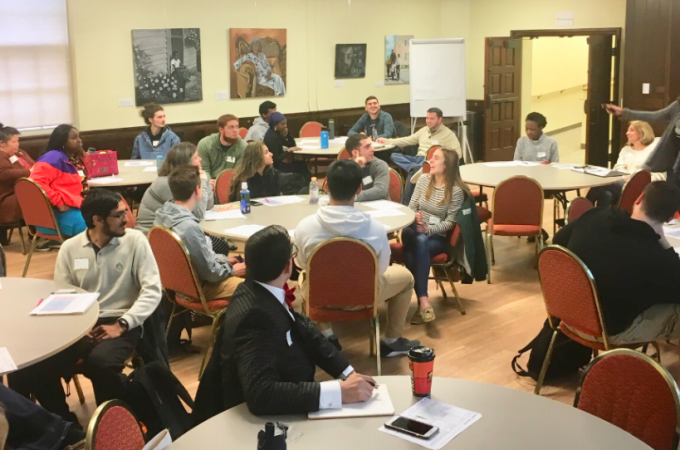 Gary Anderson, president of YCBA, wrote a letter to the founders while Lauren Andersen, vice president of the association, wrote a letter to the YCBA of 2119, 100 years from now. The highlight of the evening was a presentation by Dr. Deb Delaney, associate professor of Entomology from the University of Delaware. 100 members celebrating the 100 anniversary of YCBA. YCBA Photo. 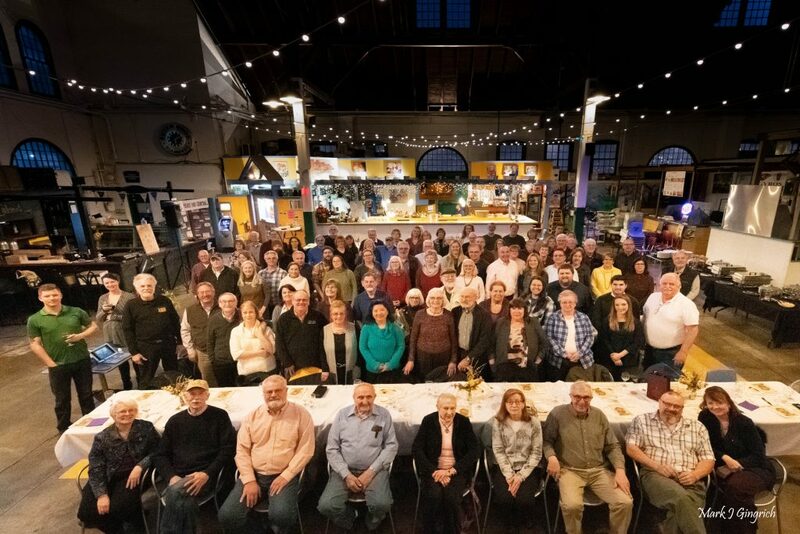 The 100 year celebration at Central Market for the York County Beekeeping Association. Jamie Kinsley Photo. The colony focuses on the collective, the state over the self. Humans are not the masters. Rather, they are the students. 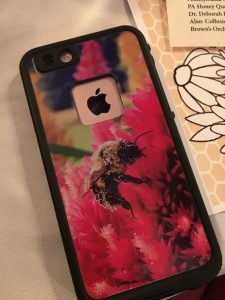 A phone case of a member proudly showcasing a bee. The phone happens to belong my mother, Anastasia Denoncourt – a YCBA member, and a picture I took last summer of a bee. Jamie Kinsley Photo. Throughout her presentation, she read poetry about bees, analyzed art, and discussed paintings. Then, her tone changed. A slide suddenly appeared on the screen with the title “The Loss of the Bees: Insect Apocalypse.” Words like “alarming,” “degradation,” and “diminishment” haunted the screen. Habitat loss, insecticides and the use of chemicals, climate change, and natural enemies are causing the bees to die. Delaney presented data including graphs and statistics that all said the same thing – insects are disappearing. Entomologists, or scientists who study insects, are aware that climate change as well as construction and development are bad news for the biodiversity of our world. The more people plant monocultural (a single species) grass lawns, fill meadows with cement, and tear down forests for developments, the less natural spaces are left for the critters. “We don’t share well,” said Delaney. Humans are asking too much of the environment; we’re dominating the natural world, and our choices are negatively affecting the insect kingdom. Ultimately, she wants us to realize that we, humans, are a part of natural world, and we will ultimately be affected, too. Man beats skunk who went after his bees. Photo from Biggle Bee Book by Jacob Biggle, 1909. Bees as well as other insects are “vital pollinators and recyclers of ecosystems and the base of food webs everywhere,” wrote Brooke Jarvis for the New York Times. Jarvis also reported that insects are decreasing in population at alarming rates. For example, the rusty-patched bumblebee dropped by 87 percent over the past 20 years. Near the end of the night, Lauren Anderson reminded us that we cannot predict the future. But, we can work everyday to strengthen the link between the natural environment and the changing, technological world. Be “the angels of agriculture,” she told us – a common thread throughout the evening’s event. The YCBA’s original meeting minutes on the formation of the group in 1919. Jamie Kinsley Photo. 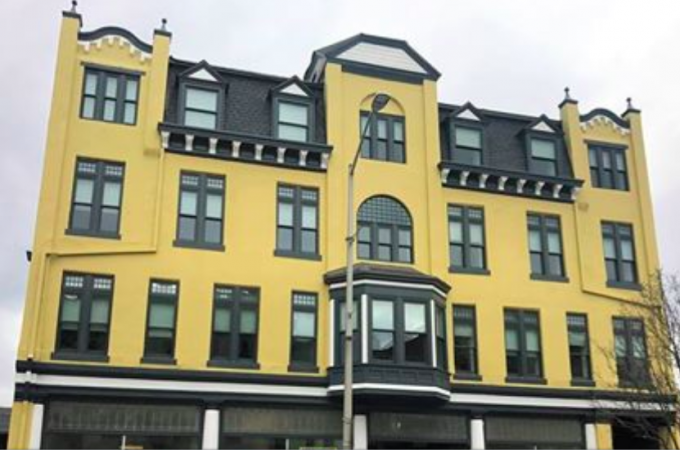 On March 8, 1919, five men organized the YCBA on W. Philadelphia St.
“100 years ago, a candle was lit. And we’re keeping that candle alive,” said Jeremy Barnes, a retired educator who has been writing and teaching beekeeping techniques for over 15 years. 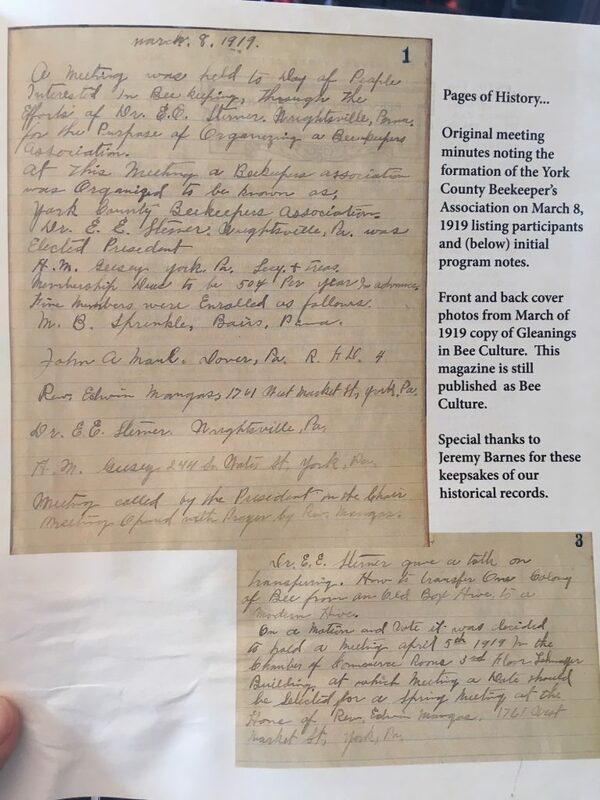 History matters to Barnes, who maintains the original meeting minutes from 1919. After a slideshow of beekeeping from 100 years ago, Dave Papke, Chairman of the Centennial Celebration Committee, proved that beekeeping hasn’t changed much. In fact, one element of beekeeping is inclusion. 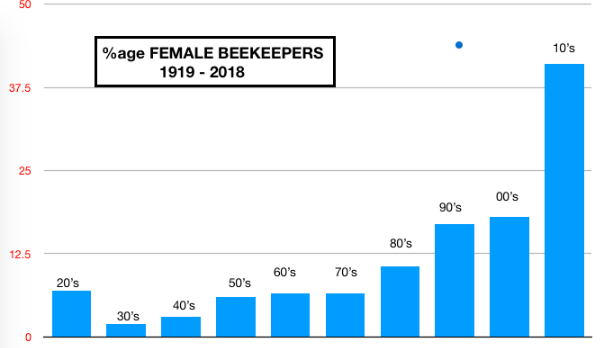 Papke made sure to highlight the participation of women in almost all the photographs we have of twentieth century beekeeping. “Honey bees do not care about one’s profession, education, background, race, etc.,” Papke said. The level of formalized education doesn’t make a good beekeeper. 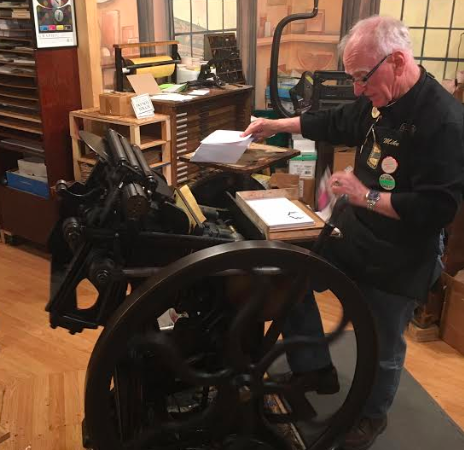 “So, we have the full range, from Ph.D.’s to self-employed artisans,” Papke said. What does matter, Jeremy told me, is how someone interacts with his or her bees. Examining mating boxes. 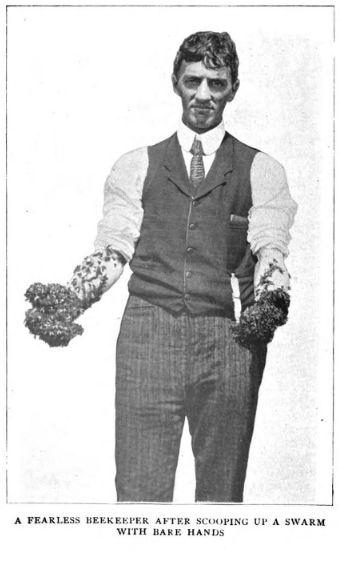 Photo from Biggle Bee Book by Jacob Biggle, 1909. 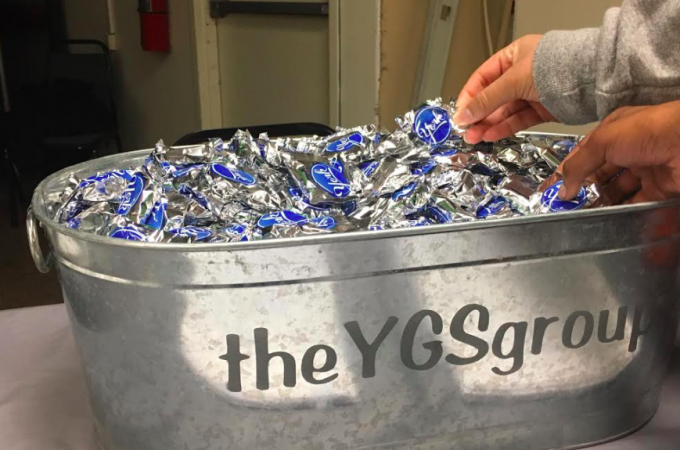 YCBA female membership is on the rise. Graph from YCBA. Barnes attributes this to the increased awareness of the insect apocalypse. Barnes believes the most important thing people should know about bees if this. Unlike wasps and hornets, including yellow jackets, honey bees are defensive. This they are not aggressive – they do not want to sting anyone. While at the celebration, I chatted with Jena Smolko and Brian McGinnis of southern York County. Bees can sense the pheromones in humans, they told me. They can tell when humans get worked up, and this agitates them causing them to sting more. More about the zen of beekeeping can be read here. 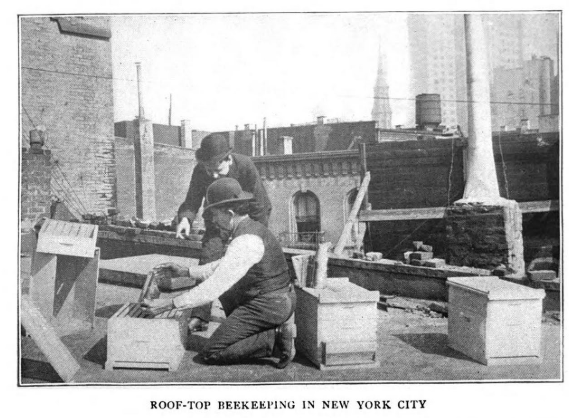 Rooftop bee keeping in New York. 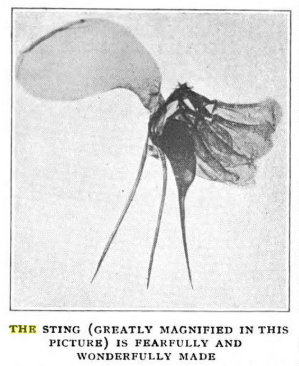 Photo from Biggle Bee Book by Jacob Biggle, 1909. 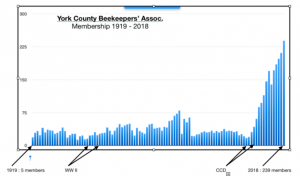 Today, the YCBA has grown to almost 240 registered beekeepers in York County with just under 2,000 hives. YCBA membership over the past 100 years. Graph from YCBA. During York Restaurant Week in May, 12 York eateries will feature York County Beekeeper’s Association honey on their menus. 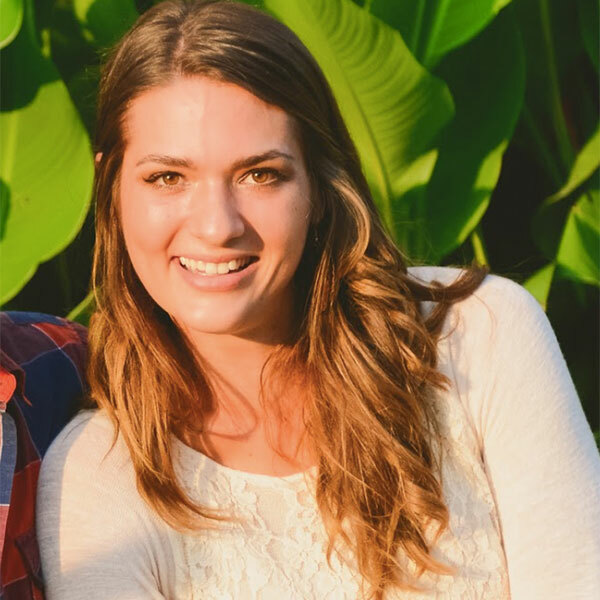 In September, about ten members from York will be representing YCBA at the 46th Apimondia International Apicultural Congress in Montréal. 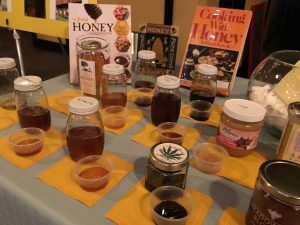 During the Made in America Week, Nixon Park and Brown’s Orchards will feature honey bee demonstrations. Lastly, in August the beekeepers will open their apiaries, or collections of bee hives, to the public. While the signs are alarming – insect populations are dropping dramatically – they are also just signs for now. However, that’s not an excuse to ignore the sirens. We should be on the lookout for native plants such as milkweed that are good for the local ecology, buy local honey, or better yet: join the YCBA and get bees. For now, I have to figure out why a raccoon was on my porch during the day. I feel bad, but I shot the raccoon. Not because I wanted it dead – it was just trying to eat dinner. But, raccoons are nocturnal and the animal was probably hunting during the day because it was sick. Part of land stewardship is making sure diseases don’t spread. This summer, I’ll also do my part in growing black-eyed susans, mint, and coneflowers that are good for bees. What’s the best part of the human relationship? 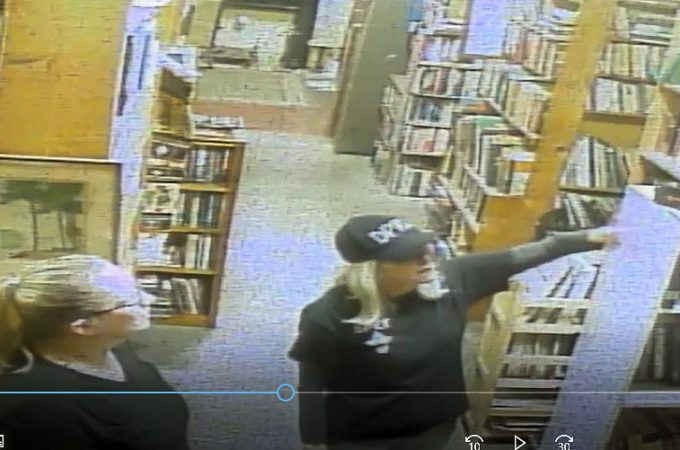 A man scooped up a bee swarm with his bare hands. 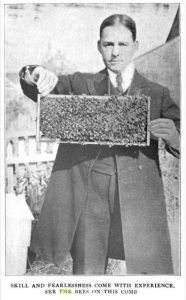 Photo from Biggle Bee Book by Jacob Biggle, 1909. The stinger of a bee. Photo from Biggle Bee Book by Jacob Biggle, 1909. Getting a queen bee ready for mail. 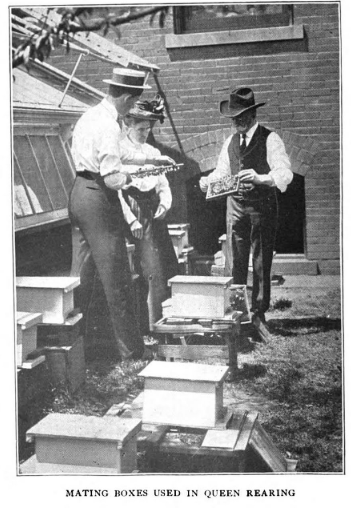 Photo from Biggle Bee Book by Jacob Biggle, 1909. This was a wonderful article! So well written as I felt as if I were there. We were sorry to have missed this once-in-a-lifetime event. Thank you all for your contribution to plan and enjoy this event! Thank you so much, Gaye!